Backed by ever growing customer demand and its additional production capacity unleashed from the fourth plant, Honda Motorcycle & Scooter India Pvt. Ltd. (HMSI) continued to breach its own sales highs ahead of the festive season in August, 2016. After crossing the 4.5 lac sales mark in July 2016; monthly sales of Honda 2Wheelers India zoomed close to 5 lac mark in August 2016. Honda sold a total of 492,416 units in August, 2016 over 395,196 unit sales in August 2015. Honda continues to lead the volume growth in the 2Wheeler industry. Honda’s domestic sales grew 25% from 373,136 units in August’15 to 466,342 units in August’16. What is significant is that Honda’s two-wheeler sales increased by nearly a lac units (97,220 units) in August’16 on year-on-year basis. 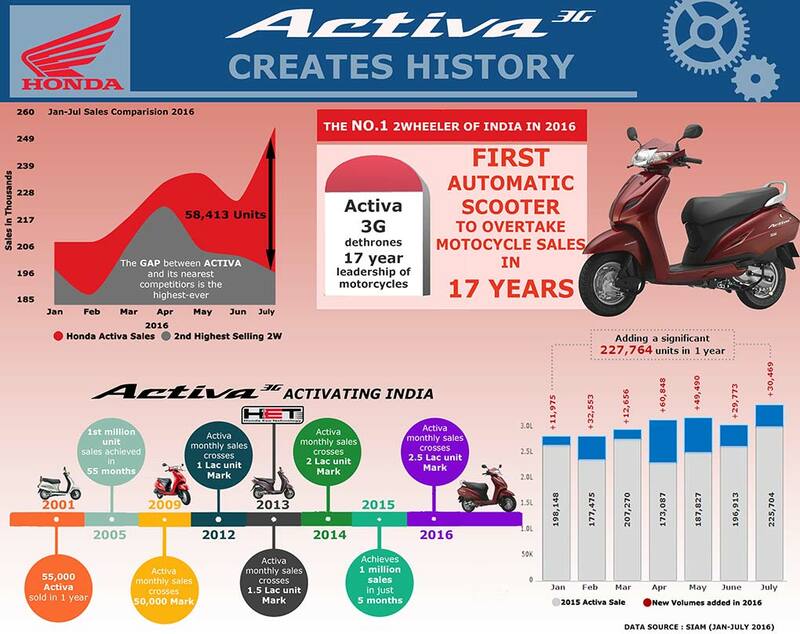 Led by Activa – India’s No. 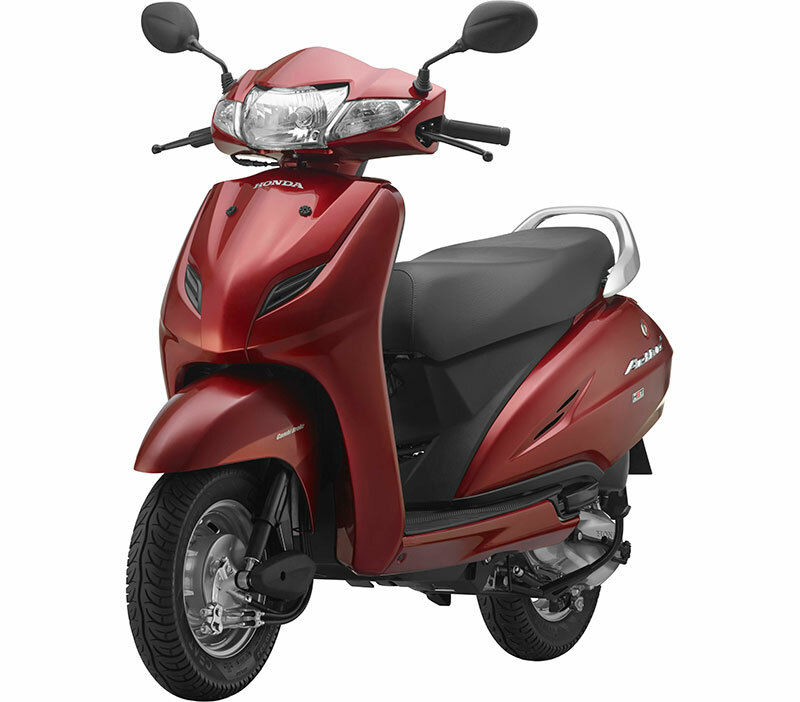 1 selling two-wheeler of 2016, Honda’s automatic scooter sales crossed 3 Lac figure 2nd time in a row to peak at all-time high of 336,393 units, growing 27% over the 246,763 units in August’15. Honda’s motorcycle sales too grew 11% from 126,373 units in August’15 to 129,949 unit sales in August’16. Honda 2Wheelers India exports reached ever-highest of 26,074 two-wheelers in August’16. For the first time ever, Honda’s two-wheeler exports crossed the 1 lac mark in just 5 months with a robust 29% growth compared to the -13% de-growth of industry exports. Honda continues to be the 2Wheeler Industry’s No. 1 Volume gainer & No. 1 market share gainer for 5 months in a row. Alone Honda added 399,470 new units in April-August’16 and phenomenal 43% of the new industry volumes came only from Honda 2Wheelers India! On the market share front too, Honda added 2% market share (the only two-wheeler company in India to add more than 1% market share) to reach at 26% dom + exp market share in April-Aug’16. August has been a historic month for Honda 2Wheelers India. Adding over 93,000 units (YoY basis), Honda’s total sales, automatic scooter sales and exports reached all-time high in August’16. In just 2 months record time and before schedule, Honda has achieved 100% peak production levels at its second assembly line in recently inaugurated Gujarat plant. The new capacity of our fourth plant gives us wings to grow at a faster pace and prepare for festive period like never before. Product milestone: Honda’s Activa ended the 17 year long monopoly of motorcycles to become India’s highest selling 2Wheeler of 2016 (Jan – August 2016) with a lead of over 1.6 lac units over its 2nd largest competitor. Best Deal: Honda inaugurated 6 Best Deal’ outlets – the 2Wheeler industry’s first organized retail set-up exclusively for certified pre-owned 2Wheelers. With this, the Best Deal network is at 107 outlets in 81 cities across 20 States.